This section is, in my opinion, one of the most difficult to ride. The towpath surface consists of a coarser gravel base which makes riding rough. Plus, the long strait sections can become quite tedious. 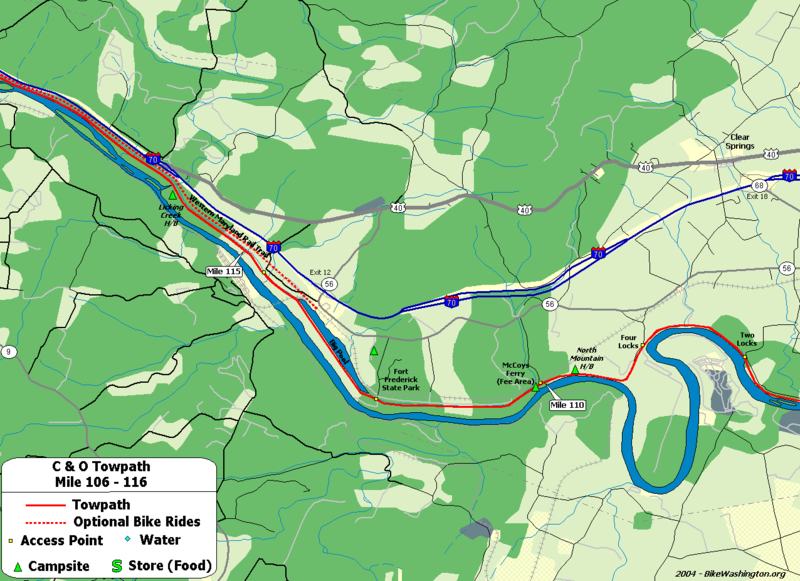 Also, the towpath follows very close to Interstate 70, so the highway noise becomes quite noticeable. However, the Western Maryland Rail Trail run parallel to the towpath between mile 115 and 124. This paved trail provides a nice alternative. There are some points of interest here. Four Locks marks one of the few spots were the canal strays from the Potomac River Basin. Fort Frederick State Park, located nearby, was used for various purposes between the French & Indian and the Civil Wars. Today, it provides several recreation facilities including boat rentals and a launch. Big Pool Lake, just west of the park, was constructed to reduce the amount of digging required for the canal basin. The single arch Licking Creek Aqueduct is said to have the largest stone arch in the U.S. Turn right onto Ashton Rd. Travel about 2 miles, then make a left onto Four Locks Road. 108.1 Charles Mill Ruins located on berm side of canal.